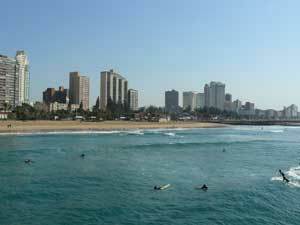 We spent a morning in Durban before driving further up the coast. 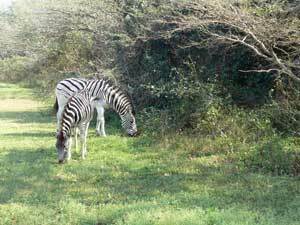 It was fairly quiet as the schools had finished their winter break. 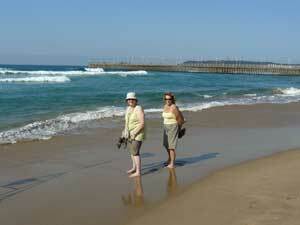 ...... and we enjoyed a paddle. 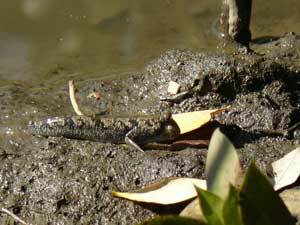 We did see some people swimmng but it was a bit cold for us. The new football stadium for the 2010 World Cup is nearing completion. 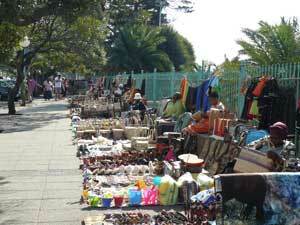 There are always plenty of street sellers on the wide walkways near the beach. 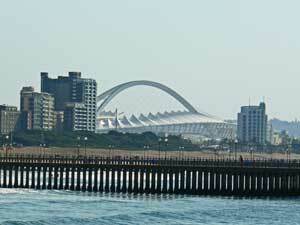 We stopped at a huge shopping mall (Gateway) to the North of Durban. 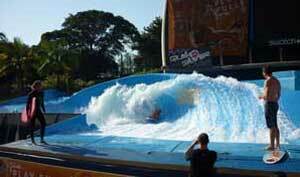 Outside the Mall are a couple of wave machines. I'd love to have a go - but only if no-one else was around! 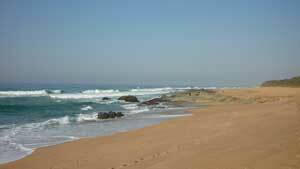 Later we had a walk along one of the many deserted beaches along the north coast of KZN - this one was at Tongaat. 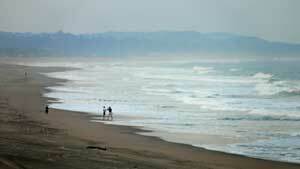 The KZN South Coast beaches (South of Durban) tend to be more built up. 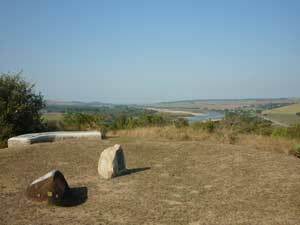 Further North we had a look around the site of Fort Pearson, overlooking the Thugela River. 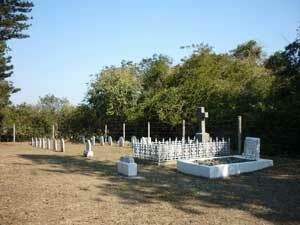 We had 2 nights at Umlalazi Nature Reserve where we walked through the heavily forested dunes to the beach. 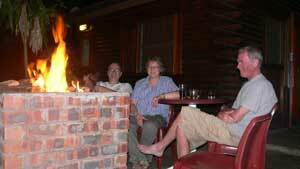 It was warm enough in the evening to sit outside - a bit of a change after the frosty nights in Richmond! 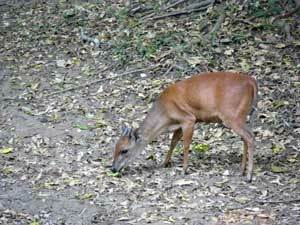 We saw plenty of Red Duiker on our walks and outside our cabin. 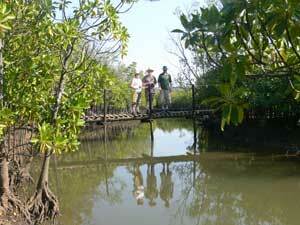 We were a 5 minute walk from a lagoon which had a mangrove forest along its shores. 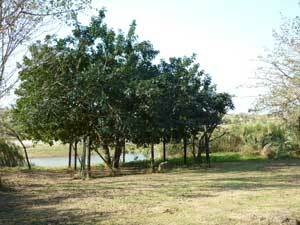 We walked alongside the lagoon through the mangroves - smaller trees than we'd seen before . 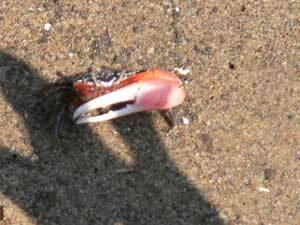 We saw plenty of tiny fidler crabs which had a single huge pincer. 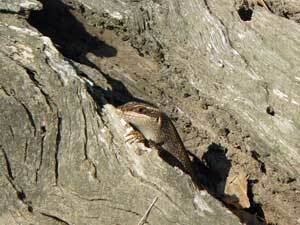 This lizard was enjoying the sunshine.